Saw this widget theme today. Thought it might be something yall could adapt. Looks like it just needs highlight color changed and an ob-theme wrapped on it. Instant favorite. Thanks for sharing cog. My 2 cents, needs some underline color on active tab aswell. This theme looks well builded. Edit: OK, underline color is there. If the background is changed to more darker we can see the underline color on a grey thin. This theme is wonderful for my little things. Many thanks to sixsixfive and best wishes to him/her. the first theme i ever hacked was his acid, 5 years ago. Now that is a nice theme. I follow regularly his github, I'm glad for your quick activation to update as soon as possible. I want to assert that last intervention has brought pretty good results, notably the above line on the active tabs. That's a good fix sixsixfive, THANKS! I had a thin underline on my SpaceFM tabs that's correspondent to "tabhorizgap.png" but i had to disable to use newest "tabbottom.xpm". 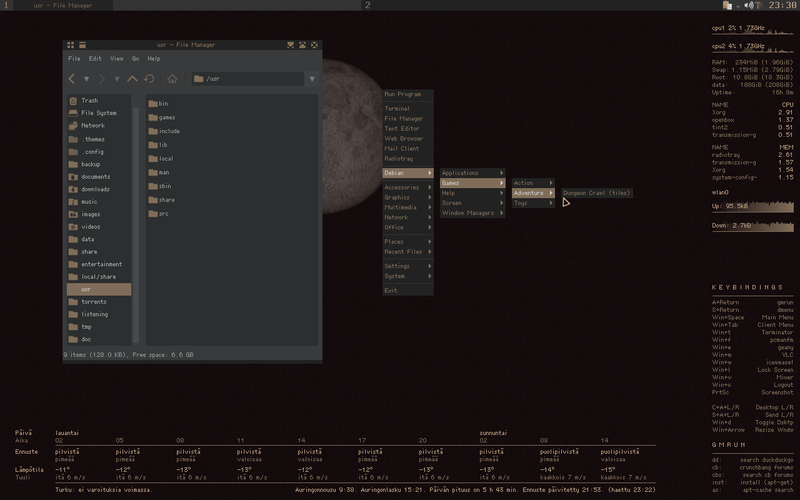 One of the greatest GTK Theme ever made. Builtd with a personal look but also for others to made some hacks like ohnonot did . A special feature of a Linux user that think "for others". Nowdays, these thoughts dosn't exist on many programmers brains. I made a little more darker for my needs. Indeed your Theme has brought pleasure and eye relief on my daily usage. I will recommend it, whenever I am given the opportunity. Anyone know about his DarK theme? seems he deleted it. Geez, I did it again. Blame the beers. Wrong thread chaps. Well, he use the github but deleted his theme, strange? This is more recent website, but github is way better for edits and hacks.